When Rathbun skulked away from the Church in 2004, he had no debts, more than $100,000 in assets and about $178,000 cash from a family inheritance—a reasonable sum to tide someone over, but not when you’re an irresponsible spendthrift. Within months, he had burned through $40,000 and maxed out all credit cards. Within a few years, he was dead broke. The lesson herein: Rathbun’s spending habits perfectly mirrored his wastage of Church funds. But now, on the outside, when the spigot turned dry it stayed dry. Accordingly, he lived in obscurity, eking out a transient living and moving from job to job because he just couldn't hold on to one. Included in his résumé: pushing a broom in a convenience store (while telling anyone who would listen he was writing a screenplay), hawking beers in a ball park, working lowly jobs in small newspapers—the kind that barely make good on their own rent. For all intents and purposes, then, Rathbun was a drifter (although at least he kept to himself). At which point his first transformation was complete; Rathbun had turned from drifter to grifter. True, business was at best spotty, but he soon had other schemes in mind. And so it was Rathbun was soon en route to Denver to see his old punching bag, and now best buddy, Mike Rinder. They were two of a kind. Rinder, having crept away from the Church years earlier, took a more direct route to become a hate-mongering anti-Scientologist. This was largely due to his innate laziness, a character trait he had honed to perfection through most of his adult life. In point of fact: He was all but allergic to work and avoided jobs at all cost. Nevertheless, and even if briefly, he went through the motions at a couple of car dealerships in Denver. The daily “grind” of having to actually show up for work was too much. He next, also briefly, threw in his lot with an Internet marketing scheme—the brainchild of another anti-Scientologist (and a man whom Rathbun had previously bilked for cash to start his squirrelly counseling practice). "The faggots are getting their hair cut, but for $1,000 a week, I guess we'll hang out with them." So much for job loyalty; so much for work ethic; so much for Mike Rinder. Case in point: The entire company folded, shortly after—and date-coincident with—Rinder’s employment. But what with Rathbun on the scene, there was at least a plan—and a damn good one to Rinder’s lights, if only because it really didn't require any work. And so it was that a drifting Rinder likewise became a grifter; and more than that he had a story to peddle. That said story was an unabashed lie from start to finish was simply what grifters do; it's called working a con and it went like this: Turn festering hatred for Scientologists into lurid allegations that would gain traction at circulation-challenged newspapers and ratings-starved cable stations, then peddle said allegations to editors/producers whom they themselves knew, and generally infuriated, while working in the Church. Sure enough, the tabloid newspaper welcomed them with open arms as they always have for any anti-Scientologist. Then what with Internet postings spinning the lies hither and thither, the boys were at last in business. Now, of course, what cash they received is not quite so obvious. After all, even in halcyon days of tabloids, American editors are loath to leave paper trails when it comes to paying for “news.” There are, however, other ways to conduct this sort of business, including free airfare, free meals, free entertainment and a “little something” from corporate slush funds. Cable TV networks play it much the same way. They, too, don’t like cutting checks to sources, but they’ll still pay hefty sums for footage and photographs, not to mention first-class flights, luxury lodgings, lavish meals and, of course, entertainment. The overriding lesson: There is always a big budget for a ratings coup or a circulation spike. Across the pond, British media were easy prey for Rathbun and Rinder. Again, they knew all the key players from their days with the Church, so it was really just a matter of rolling the Rolodex the other way—meaning: instead of setting British tabloids straight as regards Scientology, they would sell them a twisted tale of their invention and thereby cater to the basest tabloid instincts. Moreover, and even more to the point of the Rathbun-Rinder agenda: British media has always flat-out paid for information and always will. Jackpot wise, it all came together in England, when the two received an all expense paid vacation, courtesy of the media. Actually it was a foursome, with Rathbun's new wife and one of Rinder’s two girlfriends. And so they enjoyed London on the arm of a media outlet gone slumming. After virtually hugging and kissing (literally) the now disgraced anti-Scientologist journalist, the couples were wined and dined in style with the media outlet even pitching in something extra for sightseeing and obligatory shopping. And so it went: Rinder pitching Rathbun to the editors and talk show hosts he had so enraged when serving the Church, and Rathbun playing the “grizzled insider.” Of course, they make sure they have their stories straight—that’s what the paid dinners were all about. And when they ran out of lies, they spun a few more—often on the spur of the moment—then dredged up their other pals from the anti-Scientology underworld to “corroborate” and embellish. 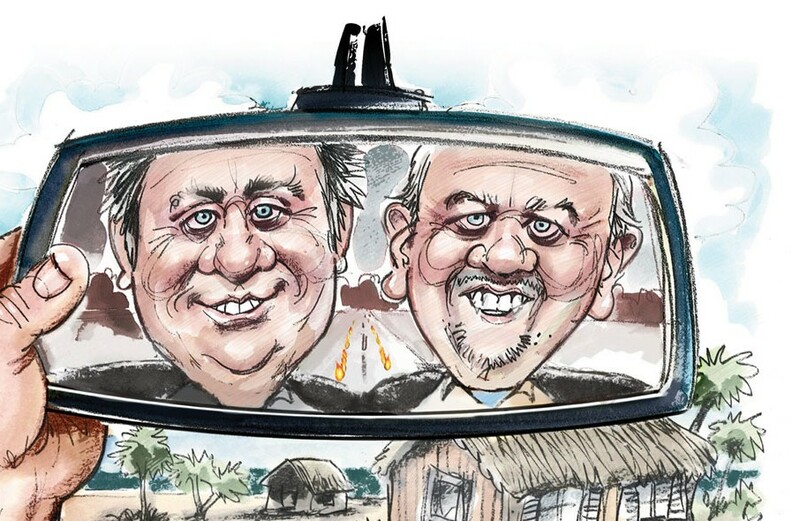 As for Rathbun and Rinder, having long lost any shred of humanity, they couldn’t care less about the collateral damage they leave behind, whether on former wives, children or the few people who ever called them friend. Because when all the dotted lines are signed, Marty Rathbun and Mike Rinder have sold their very souls.